Irker 1: difficult to use endnotes. There are good ways and bad ways to organize endnotes, making the notes easy to consult or more of a treasure hunt. Let’s start with one of the bad ways, something that makes me wonder if the book designer actually tried to find an endnote in the book — or could it be that my mind works differently than a book designer and the vast majority of readers. 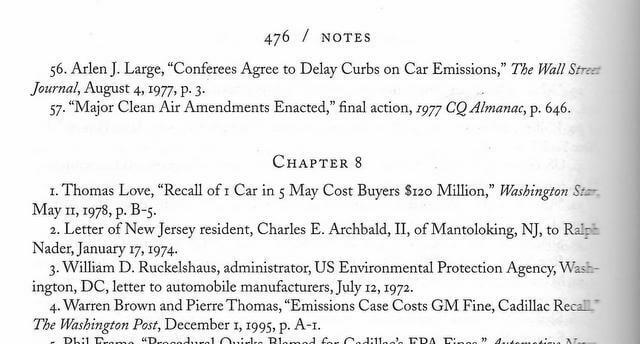 This irksome design is shown in the next illustration, the top of page 476 of Taken for a Ride: Detroit’s Big Three and the Politics of Pollution, by Jack Doyle, a monumental history of automobile pollution and battle for clean air in the United States. The blocks are headed by the chapter number but not the chapter name — so, if you are like me and remember don’t regularly remember the chapter number that you are reading, it can take a few steps to find the footnote: go to the front of the chapter to get the number, go back to the endnote section, find the chapter block, then find the note. I doubt that publishing software in past years was sophisticated enough to automatically generate the cross-reference lists, and so it would have required countless hours to manually create the page headings (headings which could all change if text was added or deleted). However, it would not have been too hard to include the name of the chapter (I doubt those change much in the final stages of production). Two excellent books that use good ways of presenting endnotes are Leviathan: The History of Whaling in America by Eric Jay Dolin and the superb Four Fish by Paul Greenberg (truly a must read book if you are interested in seafood and our damaged oceans). The notes section in Four Fish shows the page number for each note, so it’s simple to find the note you need. Leviathan is even more helpful, providing a heading that lists the page number range. Some time ago, I was browsing the incredible selection of used cookbooks at Moe’s Books on Telegraph Avenue in Berkeley, California, and I picked up a thick, expensive cookbook about maximizing flavor (I think it was Starting with Ingredients, by Aliza Green, from Running Press, 2006). The pages were beautiful, the recipes clearly presented. But the inner margin (the “gutter”) was so narrow that letters were swallowed up in the darkness, making the book only marginally usable, and definitely not a book I would purchase. This flaw is especially bad for a cookbook, something that is often propped open in the kitchen during cooking. One should not need to perform physical gyrations or break a book’s spine to read the full text To make things worse, the outside margins were quite generous, so a simple shift to the outside would have made the book much more pleasant to read. I see this far too often (IMHO) and wonder why. Is there some key principle of book design that I don’t know about? Or something inherent in the book printing process that requires such a layout?